Well there is already one of me at the top of this page... that one was in Photoshop with my wacom Intuos 3 tablet. Here are the new ones though. Like I mentioned before I will do one in SketchBook Pro for the iPad and one pencil/ink version. 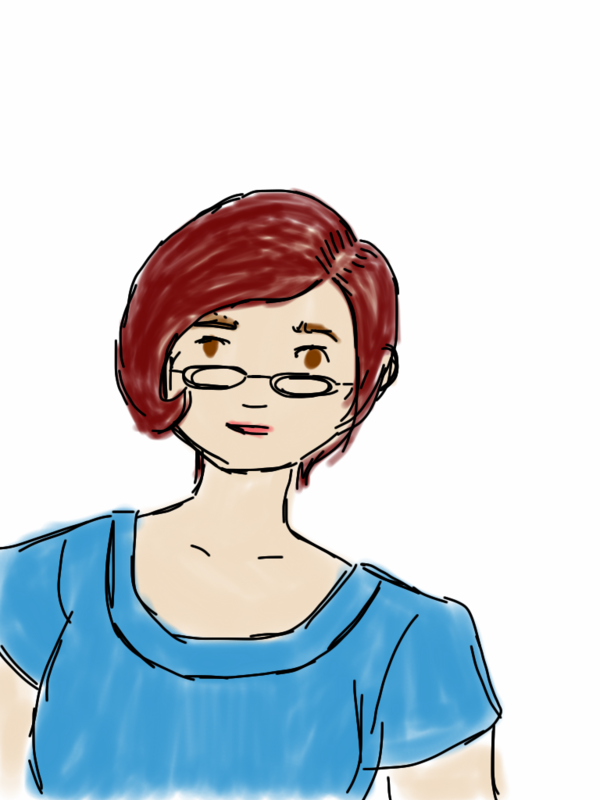 This first is sketched based off an image of myself I just took in Photobooth. The little doodle is how I usually sign cards and things. Little Black Marker started out as a comic of myself and my friends during our college semester in Rome where I bought the smallest black marker in a KaDeWe in Germany. This doodle has evolved from those comics... Ignore the hand, I can do better. Promise. Wanna see? Play Draw Something with me, I'm Angela Skees or Khyarete. And finally a horrid iPad painting. SketchBook Pro is a pretty robust app. It has several brushes, can do layers, transparencies and hex colors. And will save as a PSD file as well as the standard ones. The problem here that I will have is that there is almost no way for a stylus to get those lines as precise as I feel I am drawing them. But this will hopefully get better in time... we will see.